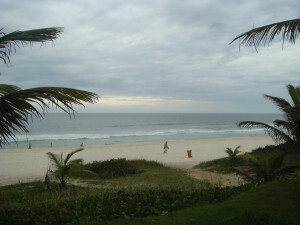 Bangolo Restaurant looks out over the palms, the broad white sands and rolling surf of Barra Beach. Bangolo sits at that end of Barra where new luxury hotels and opulent high-rise give way to smaller, older and shabbier buildings. On one side is the local square where the buses from Rio Centro pull in and out, where idle taxis wait, where, in the evening, bands of deadly earnest boys kick a football across a dusty pitch and dream of the Maracana, where, when night falls, shadowy girls sit on the roadside and hope for their time in the purple neon light of the Papillon Motel. Bangolo is a neighbourhood restaurant, frequented by convivial regulars. Groups merge, blend and expand. The affable staff spend a great deal of their night extending the tables and chairs of Bangolo beyond its borders and into the gallery of graffitti masterpieces that cover the once-grand building next door. On certain nights a band, with the look and sound of 70s and 80s USA, plays old rock covers. With the band, the convivial neighbours, the friendly staff and their furniture removals, the theatre on the street and the starlit sea, it’s easy to overlook the brilliant baked octopus and the simply sensational caipirinhas. As Rio counts down to Carnaval, the Blocos begin. All over Rio the beach crowds are building. Posto 9, the lifeguard’s tower that marks the Gay Kingdom of Ipanema, is lost in a forest of rainbow flags. Even at our own quiet, Barra Beach, the tent cafes have mushroomed into a mall. Every morning trucks from distant favelas spill forth black and white Carnaval clones, gangs of kids with bleached hair and ebony skins. They run all day, around ever-increasing circles of umbrellas, ferrying caipirinha to colonies of bikinis and speedos. The beach becomes a bustling market place; bikini boutiques set up under makeshift pareu shelters, chair to chair salesmen pedal sunglasses, sunscreen, kites, colouring books. Samba bands thread their way through avenues of deck chairs. I make beach friends with my next towel neighbour, Camilla, just inches away. But two sunny afternoons later, the distant sound of drums scatters the entire beach company. Camilla and I part in the melee. We never meet again, because like real beach friends we haven’t swapped numbers. Up on the promenade, the Banda da Barra has begun . Like its 17th century Portuguese colonial ancestor the cordoe, the bloco is a street parade with music, costumes and wags tossing water about. There are at least 400 bloco in Rio. Many are huge, spectacular and famous. Their domains are the streets of Rio Centro and the beaches of Copacabana and Ipanema. The Banda da Barra, however, is a modest, neighbourhood affair. A couple of trucks carry local dignitaries, singers and beauty queens. Families of cartoon characters and lads in drag, bikinis and speedos, pareus and towels, bare-chested, bare-footed boys, prams, wheelchairs, scooters and bikes, beach merchants, beer merchants with supermarket trolleys and can collectors all follow the bateria (band). We fall in behind. The Preifetura (council) tanker sprays us with water as we shuffle along. The samba is infectious. First our feet are smitten. Our hips go next. Soon we’re possessed. Blocos form within the Banda da Barra. 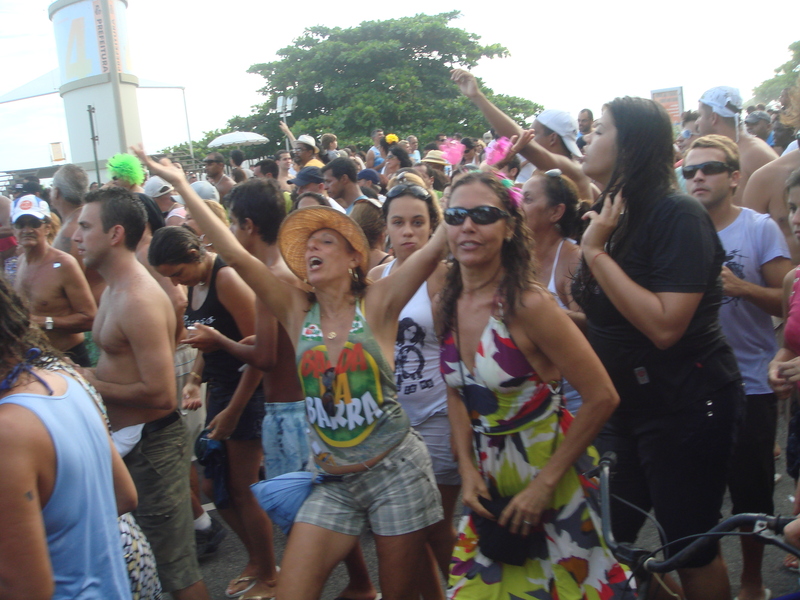 (Banda, blocos, bonda they’re all the same thing – street festivals!) The Bloco da Bundao (Bloco of the bum) sets up headquarters in the kiosk just over the road. We samba nights away there to a band with an ever-changing line up of neighbourhood grandmas and grand-dads, mums and dads and kids, in the Bloco uniform, a red and yellow t shirt with a bunda logo.